Welcome to the new golubkakichen.com! We are so excited for this very overdue transformation and hope you like the site as much as we do. The blog was designed by Hannah of Little Light Creative and the logo is the work of Erin Ellis. We are ever grateful to these two talented ladies for making our visions and dreams become reality. I’ve been all about soups these days and have tried out every single soup recipe from this book in the last couple of weeks. To be fair, I’m all about soup all the time – to me it’s the ultimate comfort food, as easy and satisfying as can be. As much as I love smooth, creamy ones, I often crave a chunky texture in my soups, thinking back to the ones I ate for lunch every day of my childhood. To most Russians, soup is a mandatory part of lunch – it’s served first, followed by a main, second course. My mother never had a shortage of soup ideas, and things like borsht, green borsht, solyanka, mushroom soup, and sturgeon uha were on the lunch table on any given day. 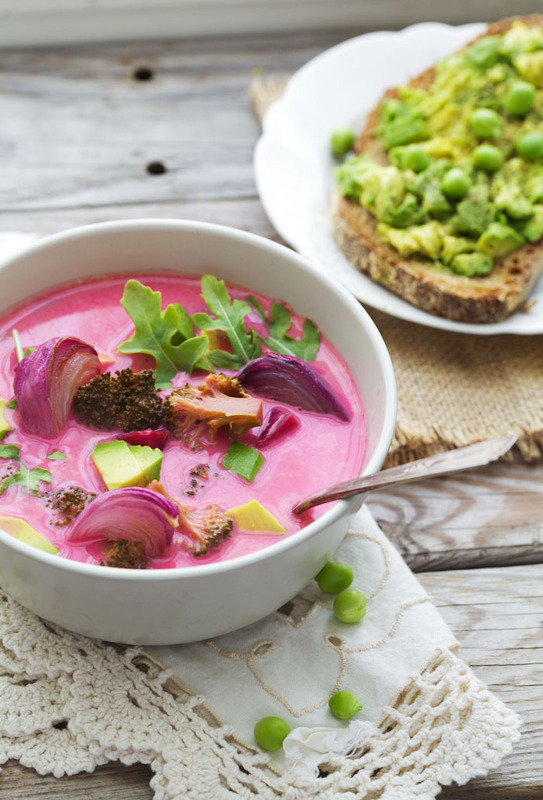 This soup is an interesting step away from the classic autumn squash soup – brilliant pink in colour, with plenty of textures and flavours to warm the soul and nourish the body. I adapted the recipe from Salatshop, a Russian wellness blog written by Olya Malysheva out of Moscow. Olya’s style is endlessly optimistic and she is great at coming up with vegetarian recipes that require no fuss. Her site and its popularity makes the Russian in me very proud – it’s great to see such an increasing interest in sites like Salatshop in the country of meat and potatoes. If you speak Russian, you should definitely pay it a visit. 1. Add beets to a medium-sized saucepan along with the garlic and a pinch of salt and barely cover with water. Bring to a boil, lower the heat and simmer until beets are tender. 2. Meanwhile, preheat the oven to 350F (180 C). Place onions on an oiled baking sheet, lightly brush with oil and roast until golden, for about 20 minutes. 3. While waiting for the beets and onions to cook, bring a large pot of well-salted water to a boil and blanch the broccoli for 3 minutes. Immediately transfer into an ice-water bath to stop the cooking. 4. When the beets are tender, add in coconut milk and a pinch of salt, bring to a gentle boil and simmer for 3 minutes. Add in the broccoli, stir to heat it through and then remove from the heat. Squeeze lemon juice over the soup and adjust salt if needed. 5. Cube the avocado. Ladle the soup into bowls and top with roasted onion wedges, avocado cubes and arugula leaves. Serve with sourdough and/or sprouted bread avocado toasts. Enjoy! The new site is absolutely stunning! Congratulations! I can’t wait to explore it more. and this soup recipe looks both delicious and beautiful. My nephew loves to eat anything pink so I am excited to cook this with him. I love your beautiful recipes and your beautiful new site! Thank you for sharing. Thank you! There is something about kids and pink color, they never stay indifferent. Paloma gets really excited about anything pink as well, including this soup. the soup looks like it tastes delicious! I also prefer a chunkier texture to my bowls. I’ve been following salat shop for a long time too. Russian literature and history is an interest of mine so always happy to find insight into modern Russian food culture! So glad to hear that you like Russian culture and Salat shop is an awesome site. Anya, beautiful site! beautiful soup!! and a beautiful way to start my day. very inspiring. Anechka, your new site looks gorgeous. I have been following you for a few years now. It is always such a great place to come back. The only thing that i don’t really like is the ad of a woman shaking her everything on the left side of the screen. I personally find these ads so annoying. Otherwise, amazing job. All the best to you in the future. Alina, thank you so much for the kind words of support. And I agree with you about that particular ad. Спасибо Алина! Все блоги очень интересные. Rebecca Jane, so glad that you like the new look! I also wish that Olya can translate her site into English, so more people can enjoy. What a pretty soup! I have made coconut beet soup in the past and my favourite aspect is totally the colour! I agree, Mallory, the color is mesmerizing. Happy to see our recipe on your beautiful blog! Gorgeous new layout! 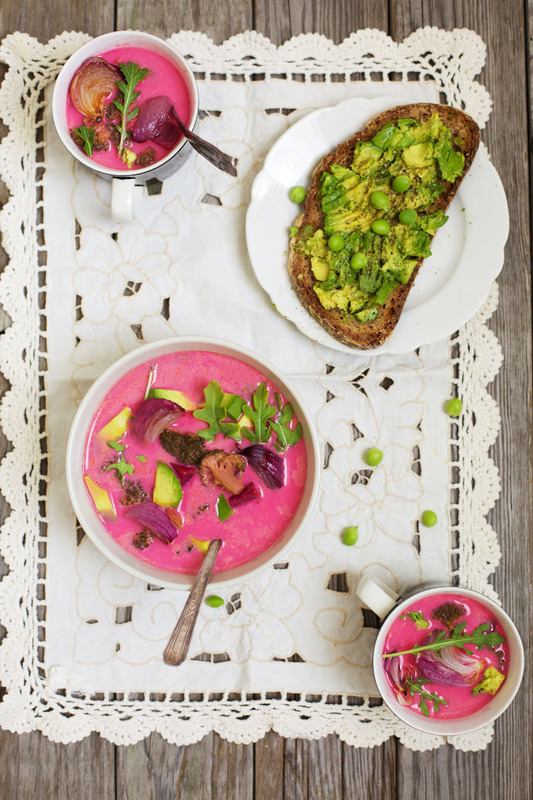 I love your pink soups – vibrant and adorable! It’s just incredibly beautiful! Amazing!!! Many thanks for the inspiration! I will learn from you! Woah this looks fantastic!! I need to try it! Isabelle, the liquid is just coconut milk, and the chunks of beetroot and its juices make it pink. Great! Thanks for your prompt answer. Have a nice day. Had the pleasure of trying this when the photo was taken; it was INCREDIBLE – I can’t get it off my mind! P.S. Anya the blog is stunning! Come back to Brooklyn! Thank you Emily! Next trip to Brooklyn is in the works. This is so delicious!Thanks for sharing! Thank you so much for this gorgeous recipe!!! I am going to make this soup tomorrow. This soup is not only gorgeous, it is easy to make and totally delicious. Thank you for another wonderful recipe. Cannot wait to make it for my granddaughter who loves pink as much as I do.